Do you find that sometimes practice makes perfect doesn't apply? That your practice session ends and you feel as though you haven't made as much progress as you know you could? Imagine making two, three, four or even more times the progress in each of your practice sessions. Practice Makes Perfect is the book you need. The information in this book teaches you how to practice music more efficiently and effectively. Applying the easy to use techniques in this book will revolutionize your practice, enabling you (and your students) to make more progress in less time, whatever instrument you play. Additionally it is an eBook which means you have instant access via download direct to your computer! Do you find you can play pieces at home but when you arrive at your lesson the pieces are never as good? The solution to your problem is on page 23! Do you find you make mistakes during exams and concerts and never play as well as you know you can? The solution to your problem is on page 105! Do you find you hit speed walls when playing faster pieces? This could be to do with the way you use a metronome. Read page 66 for advice on how to avoid the speed wall. Do you find yourself wishing you could make faster progress on your instrument? Practice Makes Perfect really does contain the keys to success on any instrument. It is divided into four clear sections, each one packed with advice and tips on how to get the most from your practice time. We are all busy and I'm sure you only have limited time for practice. Practice Makes Perfect helps you make the most of that time, fine tuning your practice technique to be efficient and effective. "If you play an instrument - you need this book"
"I bought this for my daughter and ended up reading it myself first. I learned piano when i was younger and reading this inspired me to want to start again. If only I had known all this when I was learning then I may never have become frustrated and given up. Thank you!" This is not a typical text heavy ebook. It is a colourful, easy to read book with illustrations, case studies, quotes and call-outs to break up the text and add interesting, inspirational information. Each aspect of practice is dealt with over one or two pages in simple, easy to follow language to help you apply the techniques to your playing quickly and easily. Section 1 describes basic practice techniques, gives guidance on how to use the book and has an easy to use assessment tool to check your current practice habits. Section 2 contains vital information on the relationship between how your brain works and how to practice music effectively. Use this information to kick start your playing through practising smarter - not harder. Section 3 contains the 12 keys to musical success. Apply these and hear your playing improve more than you ever dreamed! Section 4 contains extra tips and advice on how to practice including using practice games, how to prepare for concerts, exams and competitions, using practice software and how to use a weekly focus to supercharge your progress. Practice Makes Perfect retails at $14.97. It is an eBook, formatted as US Letter Landscape to make it easy to read on most computer screens. When you buy Practice Makes Perfect you will also have the option to download a FREE COPY of the Text Only Version in case you wish to print a copy without colour or illustrations. This is formatted as A4 portrait. 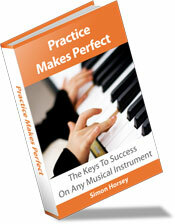 Practice Makes Perfect is in the very convenient Adobe PDF format. You will need the free Adobe Reader software to view the file. Click here to get the free Adobe Acrobat Reader. Mac users may also view the file in the built in application Preview. Just click on the 'add to cart' button below to be taken to the 100% secure E-Junkie secure payment and download processor. Your download of the book will be available as soon as your payment is processed and cleared. For total financial peace of mind I offer a 60 day, 100% money back guarantee with no questions asked. If you feel your practice hasn't benefited from reading Practice Makes Perfect let me know and I'll refund your money straight away. You even get to keep the book! Click the link below now to buy Practice Makes Perfect. Download it today and learn the real secrets of how to practice and revolutionize your playing starting TODAY!